The Mayor’s office recently took to social media, inviting Angelenos to share water-saving innovations by posting to Twitter with the hashtag #DroughtHack. It received responses from the de rigueur to the dare we try. Only wash full loads of laundry. Turn off water while brushing teeth. Install a rain barrel. Take a shower with someone. Easier to find than a dirty person who wants to share a shower, grab a bucket and bring it into the shower with you. The grey water (household water that can be reused without purification) collected in the bucket can be put to use for a second job. Clean the floors or give your pooch a bath. Even if you’re cooking for a party of one, it takes a lot of water to get your fusilli on. FEED YOUR PLANTS too when making pasta, but hold the salt. Many foods release nutrients that are actually good for plants. 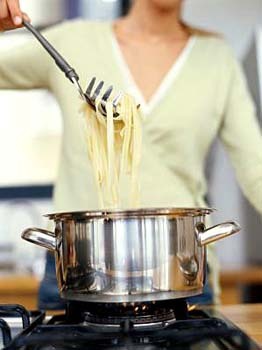 Use a pasta server to lift noodles out of the water or ease hard-boiled eggs into a bowl, wait for the water to cool, then douse your thirsty foliage. The only drawback is you can’t salt the cooking water— salt is harmful to plants. Toilets use more water than showers and washing machines. According to the Environmental Protection Agency, flushing is responsible for the highest percentage of water consumption inside homes (http://www.epa.gov/WaterSense/pubs/indoor.html). Lower usage by displacing tank water. Take the top off the toilet tank and place an object down in the water. It must be non-porous, water-insoluble and non-reactive. Good choices include large rocks, plastic bottles filled with water, pebbles and a bit of bleach, or any gold bars that might be lying around. Gold is very non-reactive right now. Ever think about all that clean water that sits in the back of the toilet tank? Probably not. But it’s the same clean water that comes out of your sink. A sink on the toilet allows you to use the water two times: first, for washing hands, then for flushing. SINK ON A TOILET allows you to wash your hands in the same clean water that comes out of the sink. it performs its second job of whisking away contents and refilling the bowl. 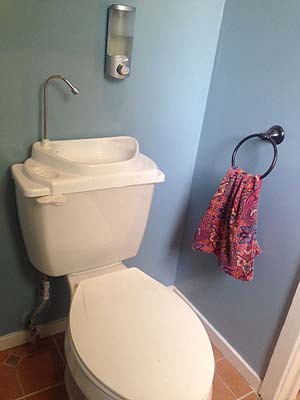 You can purchase parts for a labor-intensive conversion or buy a new toilet with the sink built-in. Even less expensive, is a Sink Positive kit that converts any toilet tank lid into a sink. It might not be an option for the master bathroom, but for secondary bathrooms and those tight on space, it’s a great water-saving option. The Getty House, the official residence of the mayor of Los Angeles, led by example and replaced the front lawn with drought tolerant plants. Could a two-for-one sink in the powder room be next? Tweeting them now.